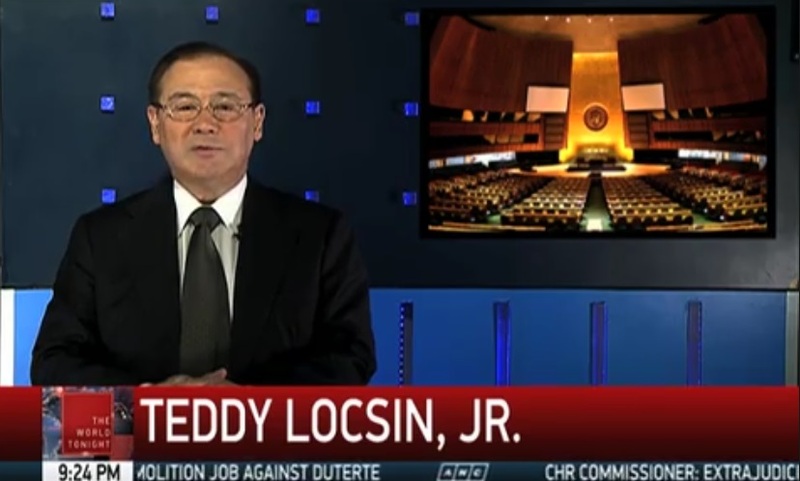 After almost six years, commentator Teddy Boy Locsin, Jr. officially signed off on Monday from ANC's The World Tonight. In his final Teditorial, Locsin, who has been appointed by President Rodrigo Duterte as the Philippine ambassador to the United Nations, tackled the U.N.'s importance as a world body. "The U.N. was not meant for big powers which can turn their backs on each other while they prey on the small," he said. "The U.N. is not even for states and governments, but as the opening phrase of the charter says, it is for the peoples of the United Nations — the people, the unprotected, the victims of big powers and their own bad governments." Locsin said he had fun doing the commentary segment, which had been part of The World Tonight since 2011. "It was a long run and very much fun to do. I hope you enjoyed it too," he said. Teditorial was Locsin's first project at ABS-CBN News after rejoining the Kapamilya news division in 2011. Aside from this, he also hosted the political program #NoFilter alongside Prospero "Popoy" De Vera, who also left ANC after being appointed by Mr. Duterte as commissioner of the Commission on Higher Education (CHED). Previously, Locsin was the host of ABS-CBN's current affairs program Assignment, and served as a publisher and editor-in-chief for the now-defunct newspaper Today. 'The World Tonight' celebrates its 15th anniversary with the return of Angelo Castro, Jr.